The bloodstains, as forensic scientists and chemists now know, were created by real blood. Immunological, fluorescence and spectrographic tests, as well as Rh and ABO typing of blood antigens, reveal that the stains are human blood. Moreover, the stains were formed by real human bleeding from real wounds on a real human body that came into direct contact with the cloth. Many of the stains have the distinctive forensic signature of clotting with red corpuscles about the edge of the clot and a clear yellowish halo of serum. The forensic experts have been able to identify that some of the blood flow was venous and some was arterial, indicating that most of the blood flowed while the man was alive and it remained on his body. There are also some stains from blood that clearly oozed from a dead body. 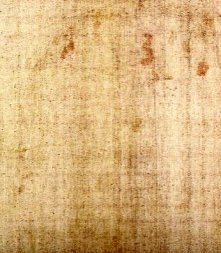 The bloody prints on the Shroud show the outline of various parts of the body, enabling pathologists to determine the position of the cloth over the body. There is wide agreement that the stains are from a man laying on his back on top of the 14-foot fabric. The fabric was draped up over the man’s head, covering his face and entire length of the body, down to his feet. As a result, scientists have also been able to determine the placement, and to some degree, the nature of the man’s wounds. The stains along once-outstretched arms show that blood emanated from the victim’s wrists and flowed downward along the forearm, past the elbow and onto the back of the upper arm. Near the man’s armpit, the patterns of the bloodstains show several rivulets and suggest blood pooled and likely dripped to the ground. It seems likely that blood dripped all along the man’s arms like rain drips from a tree branch in a storm. From the angles of the flows and rivulets, forensic experts have determined that this blood flowed while the man was upright with his arms at angles like the hands of a clock at ten minutes before two. They can also see from changes in bloodstream angles, suggestions that the man must have pulled himself up repeatedly. Bloodstains on the part of the cloth over the center of the body indicate a serious wound to the chest. The patterns of these stains show that blood likely flowed from the chest area, down the side of the body and pooled near the lower back. Much of this blood shows to be from a postmortem wound. Also, mingled with the large bloodstains in these areas are stains from, what scientists have determined to be, a clear bodily fluid, perhaps pericardial fluid or fluid from the pleural sac or pleural cavity. All of these findings suggest that the man received a postmortem stabbing wound in the vicinity of the heart. The clots, the serum separations, the mingling of body fluids, the directionality of the flows, and all other medically expected attributes would have been nearly impossible to create by brushing, daubing or pouring human blood onto the cloth. The blood, rich in the bilirubin, a bile pigment that the body produces under extreme trauma, is unquestionably the blood of the man whose lifeless, crucified body was enshrouded in the cloth; even if only for the purpose of crafting a relic-forgery in medieval times. Ray Rogers (see curriculum vitae summary below) responds to the question: "How do you know that there is real blood on the Shroud?" Several claims have been made that the blood has been found to be type AB, and claims have been made about DNA testing. We sent blood flecks to the laboratory devoted to the study of ancient blood at the State University of New York. None of these claims could be confirmed. The blood appears to be so old that the DNA is badly fragmented. Dr. Andrew Merriwether at SUNY has said that "… anyone can walk in off the street and amplify DNA from anything. The hard part is not to amplify what you don't want and only amplify what you want (endogenous DNA vs contamination)." It is doubtful that good DNA analyses can be obtained from the Shroud.